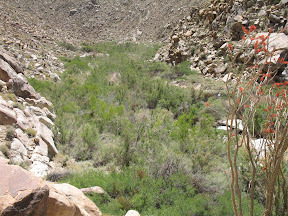 Well I have been studying Google maps as well as my GPS map software and it looked like it was possible to hike along Carrizo Gorge/Creek trail to the mouth of Goat Canyon . 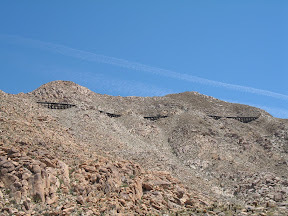 If you have been reading my BLOG you know that Goat Canyon is home of the world famous Goat Canyon Trestle. At two hundred feet tall and 750 feet long, it is one of the tallest, longest wood trestles ever built often described as an engineering marvel or "the impossible railroad". 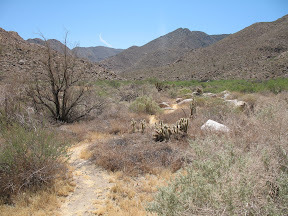 Previously, when it was somewhat legal, we hiked along the tracks from Dos Cabezas to reach the trestle and in another adventure, Mary Kaiel and I did a 3 hour hike from Mortero Wash to reach the trestle. This time I wanted to try to access it from along the canyon floor. 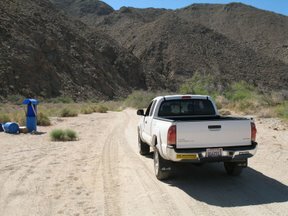 Armed with my new Delorme PN-20 GPS and steadfast confidence Mary and I jumped in her Toyota Tacoma and drove out to Anza Borrego. We hit some pretty strong winds driving over the Tecate Divide but once we dropped down into Ocotillo the wind settled down. 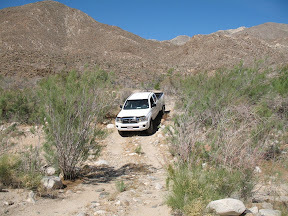 Pulled off the S2 at Carrizo Creek, put the Tacoma in low range and headed down the trail. The trail heading south through Carrizo Gorge actually goes pretty far in and there are a few somewhat technical 4-wheel sections towards the end. Let me clarify, technical for a stock, non-lifted Tacoma. I don't think the modified jeeps that drove past us had any trouble, but then again they were running 35" tires and we were still using the useless 30" Dunlops that came with the truck.. According to my GPS we were about 3 miles from the mouth of Goat Canyon from where we parked . 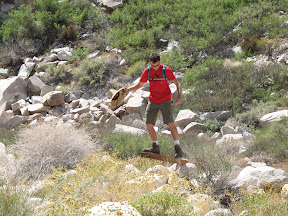 That distance is a bit misleading in that it is "as the crow flies" and I knew we would be scampering over boulders, squeezing through marsh reeds (carrizo) and trying to avoid the prolific cholla in certain areas. Still Mary and I were game and headed off along the canyon floor. The trail was pretty obvious in some places and at times would completely disappear. The GPS was very helpful in keeping us on course as were the "ducks" (trail markers). 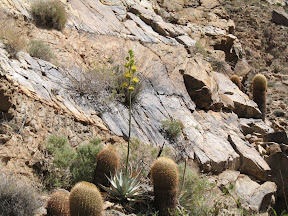 This seldom explored area of Anza Borrego is beautiful and amazingly quiet. We were constantly scouring the surrounding mountains in hope of seeing Bighorn Sheep. 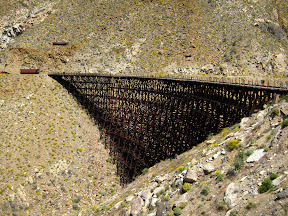 No sheep but we did get an impressive view of the Carrizo Gorge railroad high above the canyon floor. After about an hour and a half of hiking the trail disappeared and we were confronted by a somewhat impenetrable forest of catclaw. Up to this point we had been collecting scrapes and cholla thorns so the thought of squeezing through yet more vegetation was not that appealing. We opted to turn around this point which was unfortunate since the GPS showed we had 7/10 of a mile to go. I would love to know if anyone has completed this hike to Goat Canyon so let me know in the comments.